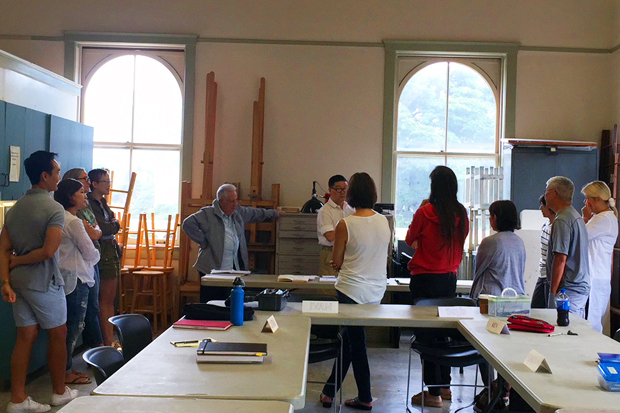 In a second-floor classroom of the Honolulu Museum of Art School, instructor Anthony Lee leads a critique of drawings by his students. “Whose is this?” he asks, pointing to one of the still lifes. “It’s wonderful, you can tell what the items are.” No matter what the artist’s skill level is, Lee finds something to single out and praise. Critiquing the works one by one, he uses them to illustrate drawing basics in engaging ways. Each drawing is an opportunity to talk about negative space, perspective and shading. “You need to be patient and you need to go slow,” he advises his class in a sonorous voice that is at once gentle and authoritative—he could have had careers as a documentary narrator or therapist. That voice makes you take everything he says as a cardinal rule. So when he remarks, “The moment you feel comfortable, it will come naturally,” you are sure that moment will come. Critique session in Anthony Lee’s drawing class. The students cover a wide range of ages and backgrounds, but many of them do have something in common—they are Lee acolytes. Out of 23 students, 18 have previously taken the class—and most will continue to do so. This year marks Lee’s 20th anniversary as an Art School instructor—he joined the teaching staff in February 1998, when he got his start leading a Saturday drawing class for high school students. Lee moved to Hawai‘i from New York in 1997. Though born in Seoul and educated on the East Coast, his family has long ties to the islands, starting when his family made a two-day stop in Honolulu en route to New York City, where his grandfather was head of the Korean Pavilion at the 1964 World’s Fair. Shortly after his arrival in Honolulu, Lee took a class with George Woollard at the Art School. He enjoyed it so much he signed up for an art trip to Italy that Woollard led that summer. “It was absolutely glorious. After years of working in New York City, getting married and divorced, and coming to Hawai‘i, it was a sense of freedom. 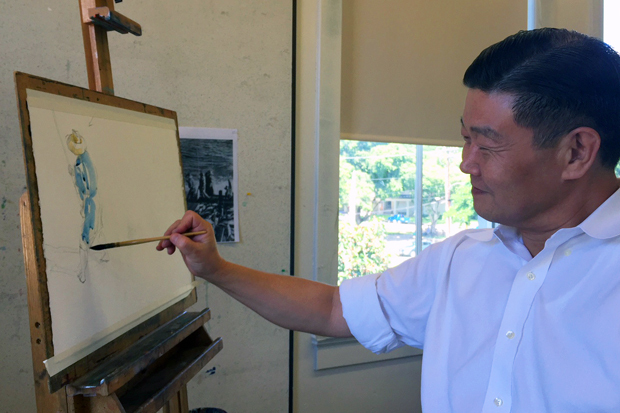 Upon his return to Honolulu, Lee, who has a degree in illustration from the Rhode Island School of Design, inquired about teaching his own class at the Art School. Then Art School director Carol Khewhok suggested he start off with the weekend high school class, and he’s been inspiring students ever since. In his signature khaki shorts and crisp, white button-down shirts (Brooks Brothers is his favorite), Lee is an unmistakable presence at the museum. His sense of style is what led him to become an associate designer of men’s wear at Ralph Lauren, where he got his start as a freelance illustrator. But simply drawing what others designed wasn’t the end game for Lee. One day he arrived at work dressed for his date at the symphony that evening. And after lunch, he accidentally walked in on a meeting Mr. Lauren himself was having with his design directors. Lee turned around and tiptoed out, but not before he made eye contact with Lauren, who was going over design concepts for the following season. That’s not all he did. “He said, ‘I like the way you look, I like the way you dress, and you are going to work with me.’ So I became associate designer on that day,” recalls Lee. In a session of his watercolor class, Lee passes out a photocopy of a vintage image of longline tuna fishermen at work on a boat. 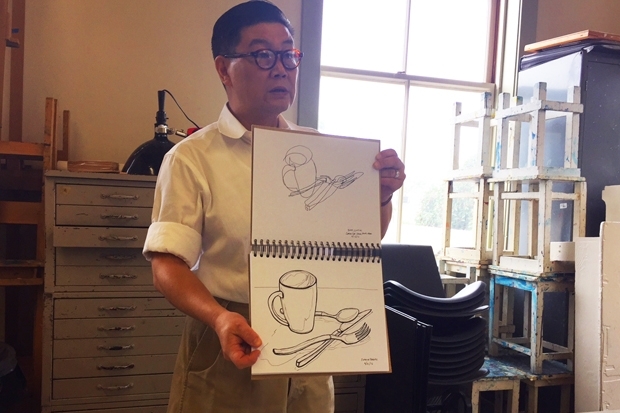 “I chose this because there’s nice contrast of fabric folds,” says Lee to his students. Then he goes to his easel and demonstrates how to really see the image, then sketch it, laying a foundation for watercolor. “How did you deal with his left hand?” asks a student. “I made it like a fist. Let’s not get too caught up in does he have five fingers? Is he local Japanese?” Everyone erupts with laughter. 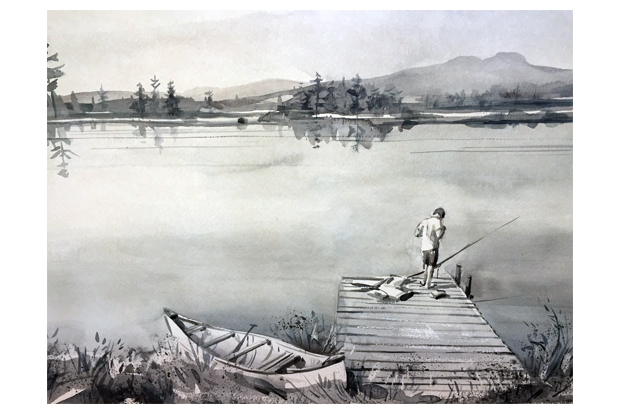 He shares a black-and-white watercolor landscape he has done of a figure on a lake dock, preparing to fish. It’s a beautiful work, you feel like you could put your finger to the water’s glassy surface and cause ripples. Such a wonderful article and totally right on! Anthony does engender such a sense of belonging as well as a skilled and positive learning environment. I’ve learned so much art history and how it reflected its place in time through his interesting glimpses into the past. Anthony and George Woollard have taken two different trips to Italy with students since I’ve known him. Folks who went absolutely loved it! It is so great that the Academy is honoring Anthony Lee and 20 years of inspiring artists! I am one of those many students who keep coming back to Anthony’s class. My first water color class was in 2005. It was, and still is, an unexpected gift of art history, technique, and creativity all in a beautiful sharing environment, that only Anthony can create. I have had other instructors, but Anthony has taught and inspired me the most!